Step into the world of aromas and flavors of traditional Indian cooking, where every meal is a burst of flavor, a perfect balance of the sour bite of the tamarind, the burn of hot chili peppers and the sweetness of the palm sugar whether it is with fresh seafood, meat or vegetables served with fluffy plates of steamed rice and warm, hand formed griddled breads. Let My Indian Kitchen help you unlock the “hidden magic” of Indian cooking. A collection of easy-to-prepare, straight forward Indian recipes created for the modern living and entertaining. 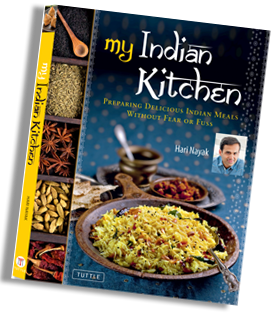 The recipes are very approachable which explores the diverse world of Indian cuisine.